AgendaX™ leverages your investment in Microsoft Exchange calendaring by publishing a consolidated, graphical summary of Outlook Calendar information on your corporate intranet. It gives managers, group secretaries and co-workers an instant, graphical view of where people are, what they are doing, and when they are next available, along with vital contact details and ‘on-the-spot’ booking. There’s no need to ‘load up’ individual calendars in Outlook to work out a convenient meeting date - it’s all there at a glance. You can also view the availability of Outlook resources such as meeting rooms, parking spaces and AV equipment. Ideal for large or mobile organisations, AgendaX can be used to securely consolidate calendars across different parts of the company and rationalise time zones across countries. There’s also support for Microsoft Office 365. The simple and elegant design of AgendaX adds real value to many parts of the organisation. Never has a group and resource scheduling been so easy! AgendaX offers a rich set of views, including an instant ‘who is where?’ snapshot, as well as daily, weekly, monthly, and quarterly views for individuals or groups of users. Availability is shown using different colours or symbols (i.e. free, tentative, busy, out of office, sick, holiday and other categories). You can also display other vital information such as a ‘phone extension, photo, a mobile phone number and an instant email link. Individuals can create their own ‘group views’ to reflect team members, favourite meeting rooms, etc, without having to open or share calendars or use the Outlook Calendar Scheduling Assistant. They can also book meetings on the spot, again, without the need to use Outlook. All bookings are synchronised back into Exchange, and security is fully honoured - e.g. managers may see details of appointments whereas a receptionist might just see if someone is ‘in’ or ‘out’ of the office. Appointments marked ‘private’ are never published. Organisations operating across multiple Exchange locations or domains or working with Office 365 can use AgendaX to give consolidated views of personnel and resources. It can also help take account for changes in time zone when scheduling teleconferences or managing around-the-clock support resources. AgendaX can be used to offer extranet services to clients via the web. For example course bookings and consultant availability can be published to selected clients. AgendaX reporting can also be used by business and HR managers within your organisation to report on activities, chargeable days, sick days etc. 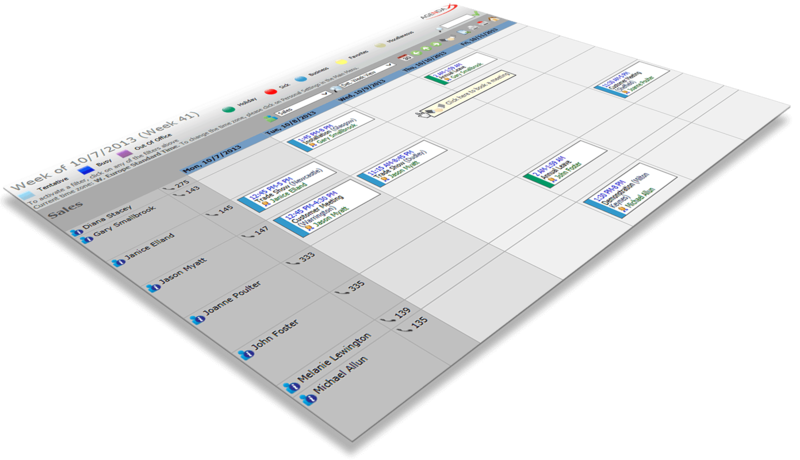 Why users love the group calendaring solution of Agenda X? Synchronises seamlessly with Exchange using MAPI connections. Customisable to reflect corporate identity and business needs. Complete support for all Outlook properties (Mileage, Billing etc) including user-defined Outlook fields. Optionally displays information from Active Directory such as phone, fax, mobile, department, picture, photo etc for each user. Enables instant emailing with a handy ‘mailto’ link. Allows meetings to be requested via the web without Outlook, with the option to restrict bookings to free time only, make location a required field, etc. Consolidates views across Exchange servers, locations, time zones and even separate domains/organisations and hosted Exchange services (Office 365). Allows staff to create their own co-worker and resource views (e.g. project team members and favourite meeting room). Easy-to-use administration ‘homepage’ simplifies configuration. Enables filtered export to Excel for further analysis, e.g. time spent on chargeable project work. Supports Exchange 5.5, 2000, 2003, 2007, 2010, 2013, 2016, and Office 365. Don't just take it from us, see what our customers say about AgendaX and working with Essential! 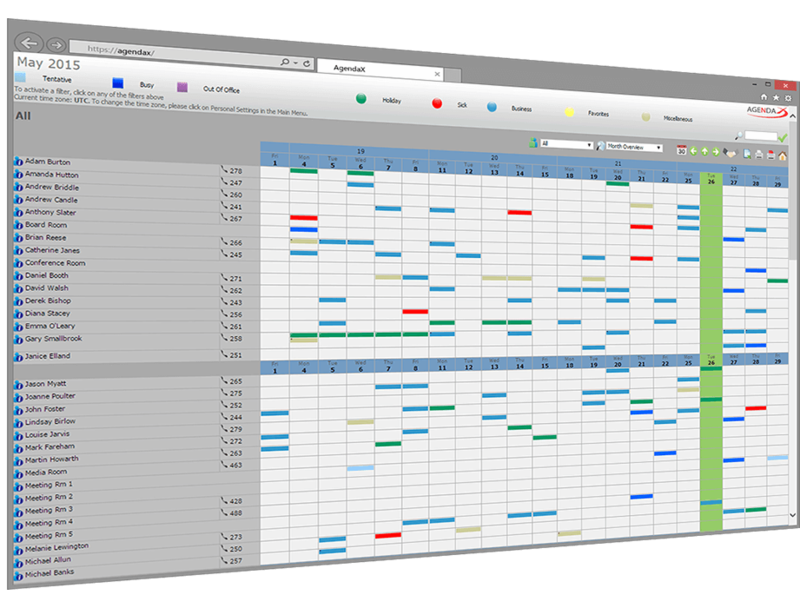 Ready to get an enterprise web-based group calendar?